Normal 0 false false false EN-US X-NONE X-NONE Partners accept Wetland Stewardship Award. Photo by Ashley Stevick. The Montana Wetland Council praised the initiative for outstanding work helping private landowners protect and restore critical wetlands along the main stem of the Flathead River and the north shore of Flathead Lake. Wetlands act as natural filters to protect water from runoff, and are habitat hotspots for fish and wildlife. The Flathead River to Lake Initiative includes local landowners, Flathead Land Trust, Flathead Lakers, Montana Fish, Wildlife & Parks, Flathead Audubon, American Bird Conservancy, Montana Land Reliance, Confederated Salish & Kootenai Tribes, Flathead Conservation District, and the Natural Resource Conservation Service. Its mission is to help landowners conserve and restore the farmlands, wetlands, streamside and lakeshore areas that keep our water clean and lake beautiful, provide for abundant hunting and fishing opportunities, and protect family farms (click on image to enlarge). Siderius and Bissell thanked the many generous partners and landowners who have exercised their property rights and protected and restored habitat along the river and north shore. In particular, several members of the Louden family were recognized for their recent project to conserve 1,088 acres along 3.7 miles of the Flathead River, including Church Slough. 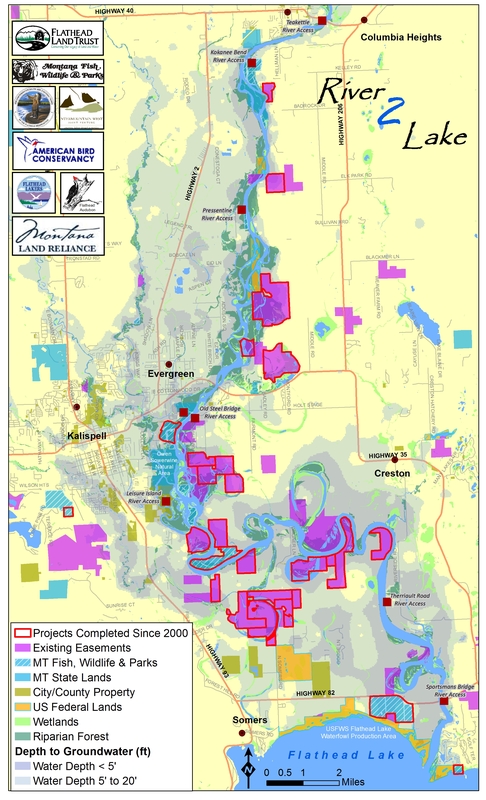 The Flathead River to Lake Initiative has worked with local property owners to protect more than 5,000 acres of lands along the river and at the lake’s north shore, including over 1,000 acres of wetlands and 14 miles of the river banks (see map). Ducks Unlimited, The Nature Conservancy, U of M Flathead Lake Biological Station, Montana Natural Heritage, Trout Unlimited, Montana Wetlands Legacy, Montana Conservation Fund, Bonneville Power Administration, NRCS Farm & Ranchland Protection Program, U.S.F.W.S North American Wetland Conservation Act, Flathead County Planning and Zoning, Department of Environmental Quality, Intermountain West Joint Venture, Department of Environmental Quality, Environmental Protection Agency, Montana Department of Transportation, Media Resources, and others. Siderius and Bissell thanked the many generous landowners who have exercised their property rights and protected and restored habitat along the river and north shore. In particular, several members of the Louden family were recognized for their recent project to conserve 1,088 acres along 3.7 miles of the Flathead River, including Church Slough. The Flathead River to Lake Initiative has worked with local property owners to protect more than 5,000 acres of lands along the river and at the lake’s north shore.